Color Labels On Demand: BS5609 Is No BS! This week, Epson America, Inc. received notification from Pira International (http://www.pira-international.com/Home.aspx), the worldwide authority on packaging, paper and print industry supply chains, that the TM-C3400 ink in combination with new Kimdura poly facestock for inkkjet from Neenah received certification for Section 3 of BS5609 specification. 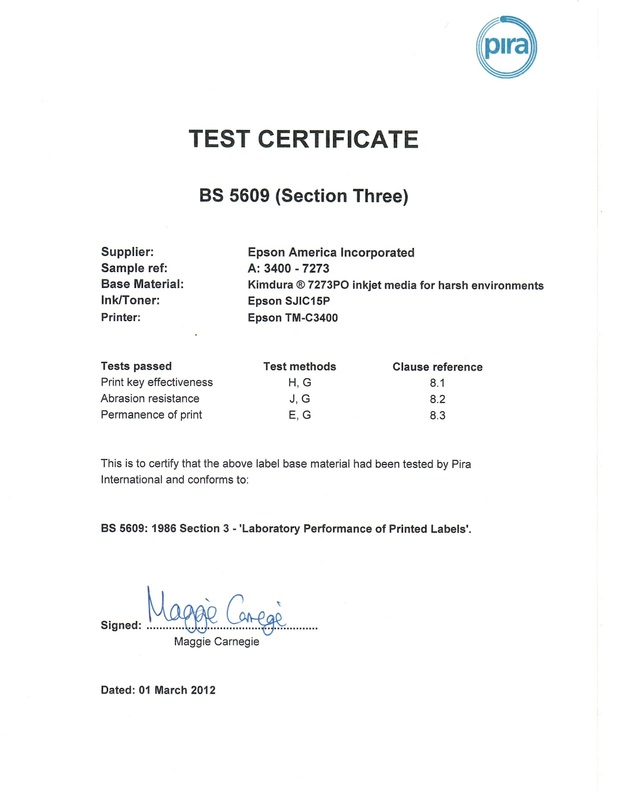 British Standard BS 5609 is a specification for printed pressure-sensitive, adhesive coated labels for marine use which includes requirements for the label base material. 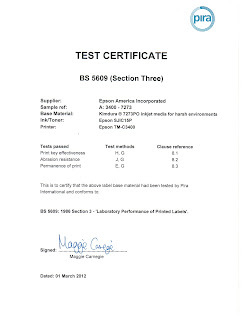 BS 5609 testing is a requirement for self adhesive drum labels needing International Maritime Dangerous Goods (IMDG) certification. Testing includes a 3 month exposure of labeled test plates in salt water. According to Doug von Dollen, Media Specialist for Epson America, Inc., “Epson is very happy to receive the BS5609 certification. This approval shows the durability of the Durabrite inks in combination with the Epson qualified media; and will support the sales effort of our value added reseller partners into the worldwide chemical market”. As mentioned by Doug, the BS5609 is especially important for chemical companies who need to comply to the global harmonized system of labeling (GHS) requirements. Under this UN initiative, companies shipping chemical products international currently, and probably for any chemical shipments at some point in the future, need to comply to this requirement. You may remember the other companies I have mentioned in my blog, Octochem- (http://colorlabelsondemand.blogspot.com/2012/02/chemistry-opportunity.html ) and Oakwood (http://colorlabelsondemand.blogspot.com/2012/02/un-drives-print-on-demand-color-label.html), both who needed to comply to the GHS initiative. This new media and approval has come at a perfect time for my sales efforts. At this time, I am working with a reseller on an opportunity with a chemical company. In order to move from preprinted to color labels on-demand, this company required media to withstand Isopropyl Alcohol (IPA) with no smearing. Take a look at my very simple test results. The ink and media showed no signs of smearing after spraying IPA. Shortly, our media partners will have this new media readily available for your chemical companies to use. 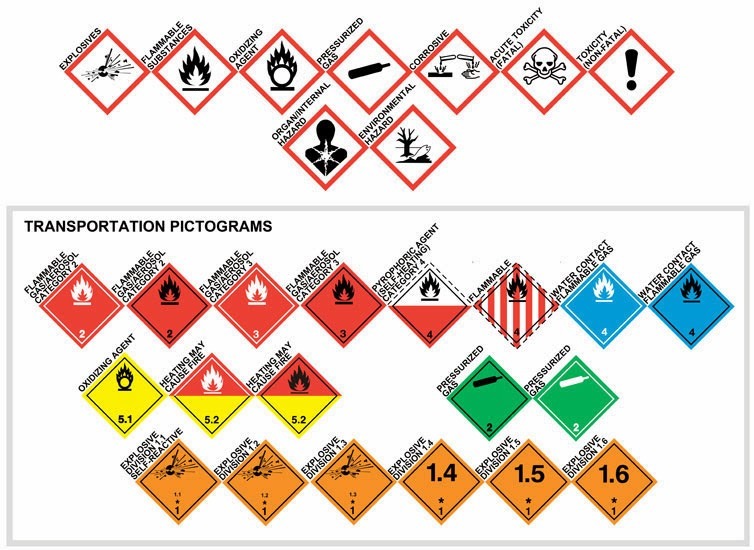 Contact me to discuss how we can help your customers comply to the GHS requirements as well as move to on-demand color labels.